In June 2002, he graduated high school and immediately enlisted for a four-year hitch. One month later, he hit boot camp. In September that year, he left for Iraq, manning a machine gun. He fought in Nasariya and Ramadi, 70 miles northwest of Bagdhad. Then serving a second tour in Djibouti, Africa, going on as a Marine Sniper in Iraq. On April 13, 2005, on his third tour, Eddie was shot twice in his head, once in his lower jaw and once above his eye. 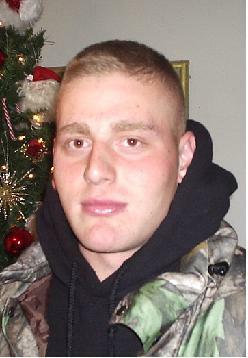 Eddie was severely wounded and suffered a traumatic brain injury. Now, because prayer is going strong for our American hero, Eddie is recovering and doing well. 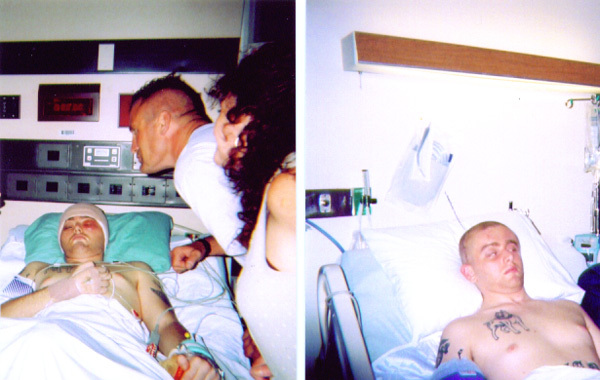 On April 14, 2005, two Marines walked up to my door, where my wife Angie was home alone. They came to tell her that her son was seriously wounded, they then notified me at work to come home but would not say what part of Eddie’s body had been hurt and how. As I pulled up the driveway, the Marines, were waiting for me, that’s when they gave me the news that Eddie had been shot twice in the head. Condition was Critical to Grave on the initial P.C. report. There aren’t words to describe the next 24 hours as we waited to hear more. That was our Eddie, one of the brave. Dr. Jackson in Germany told us he didn’t expect Eddie to live and to prepare for that outcome. At that time, they also asked if we would consider donating his organs. All I did was sit by Eddie’s bedside morning till night watching the life support go up and down praying to God to let him live. By the third day, the doctor said if the miracle does happen and he does survive, he will not recognize you or your wife, his bedroom or his dog. We prayed to Jesus and in my darkest hour the verse I said to myself over and over was Psalm 50:15 “Call upon Me in the day of trouble; I shall rescue you, and you will honor Me." To the doctors report I would repeat the words of Matthew 19:26 "With man this is impossible, but with God all things are possible." On the 5th day they stabilized him enough to fly him home to the land he gave his all for and into Bethesda Naval Hospital in MD. That’s the best hospital in this country, but despite their best efforts, the doctors offered little hope for Eddie’s survival. They told us if he made it past the 5th day, his chances of survival from the wound increases, but his chances for infection and blood clots that could kill him also increased. That’s when we asked for a network of prayer and that’s when we heard from WABC’s Mark Levin who asked all of his listeners to pray for Cpl. Ryan, Sean Hannity also mentioned him on his radio program as well. I’m not even talking about the thousands of prayers from our own community especially our church Ellenville Assembly of God and Pastor Cates. Day by day as he was in ICU, the prayers were working. Eddie was fighting and at 3 ½ weeks Eddie was off the Life Support that the doctors said he would be on for the rest of his life. Eventually, weeks after that, Eddie started tracking us with his eyes. One day a peer of his Sgt. Taylor White, who was an experienced Marine sniper, came to visit him from Hawaii, Eddie did the unbelievable he SMILED. 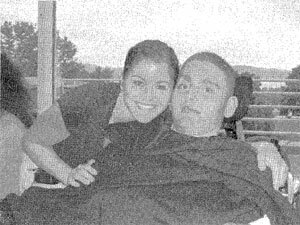 Eddie fought his way out of ICU but wasn’t moving any parts of his body. He started to move his head back and forth about 6 weeks after being shot. And all through Bethesda we met other families with other seriously wounded Marines, that we inspired with our faith in God and that they inspired us with their courage. Eddie moved to an extensive military rehab/hospital in Richmond, VA, McGuire VA. That’s were he said his first word, he looked at his mother and said “Mom”. That was a great day, the next day I was bending down telling him I loved him and he looked at me and said, “love you too Dad.” We knew he recognized us at that point. In Virginia, they were able to remove his feeding tube which was an enormous step and encouraged us so much. 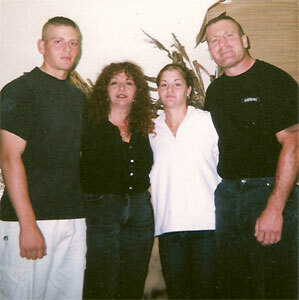 Eddie’s weight in Iraq before being wounded was 200 lbs., his body was so swollen in Germany he ballooned up to 250 lbs. Before he started eating regular food he was down to 170 lbs. he had lost all of his hard earned muscle and was so skinny. Eddie was moved to Helen Hayes Hospital in West Haverstraw, NY where his weight increased to 193 lbs!! Eddie regained the ability to sit up in his wheel chair and full use returned to his left arm. In his right arm he has limited use. Eddie is not paralyzed, but because of his brain injury he is not able to make those connections therefore is not standing or walking yet. As for him not remembering us, God answered our prayers, that was definitely our main prayer after asking God for his life. Eddie has full memory and knows the person of everyone who comes to visit him that he knew before. We talk about his childhood and he remembers it all, he has a sense of humor and his sister Felicia makes him laugh all the time. His speech is limited, at this point but he is starting to say complete sentences and initiating thoughts. It's getting close to the time we will need to bring him home and it's not ready yet. We thank you all for your prayers first and foremost, and the financial help you have given.